Antimicrobial resistance (AMR) poses one of the most important risks to our health today. AMR occurs when an organism develops resistance to an antimicrobial that is used to treat it. Antimicrobials are an integral component of health care delivery, antimicrobials need to be readily available and effective. When resistance emerges and the effectiveness is reduced it has a significant impact on an individual’s treatment and the community more broadly. The Australian Government Department of Health has released the First National Antimicrobial Resistance Strategy to combat the threat of AMR across human health, animal health and agriculture. Surveillance of AMR and antimicrobial use (AU) is a key objective of the strategy, and a fundamental requirement for effective action to address AMR in Australia. 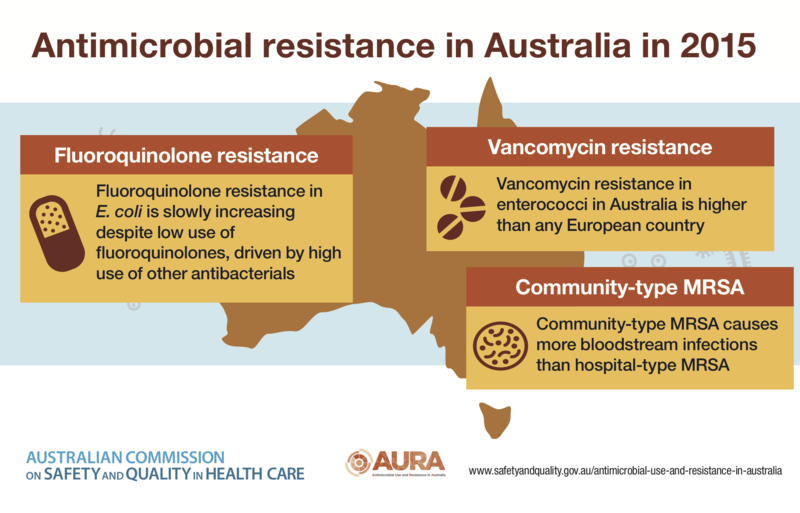 The Australian Government Department of Health has provided funding to the Australian Commission on Safety and Quality in Health Care to develop a national surveillance system for AU and AMR: this is the Antimicrobial Use and Resistance in Australia (AURA) project. The AURA project is vital to Australia’s efforts to prevent and contain AMR as it will provide information needed to understand where and when specific threats emerge, as well as guiding efforts to mitigate the risk of AMR at a local, jurisdictional and national level.